This bristlecone pine tree, affectionately named “Methuselah” has been standing for about 4,850 years in California’s Inyo National Forest. 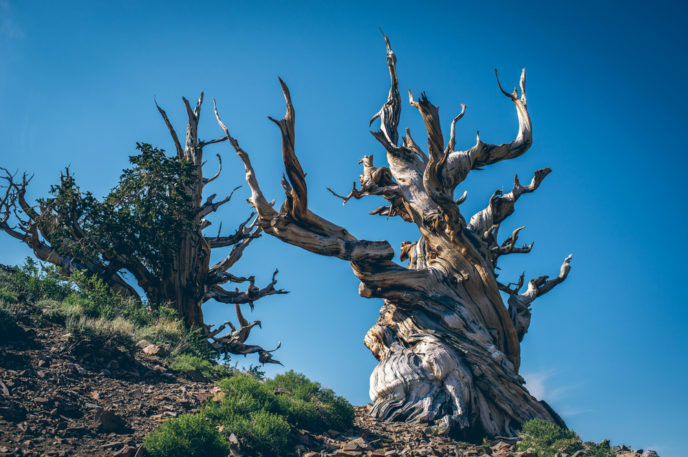 Once considered the oldest living tree, another bristlecone pine from the same forest was recently discovered to be even older—a whopping 5,000+ years old. Methuselah, and others like it, are pieces of living history that have provided scientists with data from many major natural events—forest fires, earthquakes, volcanoes, and more. But although these living legends have withstood the test of time, they each started their lives the same way—as just a simple seed. Imagine that. A single seed blown by the wind is planted in the most opportune of places. It receives the perfect amount of sunshine and rainfall to help it sprout. The little seed grows taller and stronger day-by-day. Many years pass and now the seed has seen its fair share of trials. Still, it remains strong and unwavering. Hundreds and then thousands of years go by, and still—the tree remains firmly rooted. Some seeds blow in the wind and land in a place that is not conducive to growth. Why did this seed grow into such a magnificent creation? In short, it reached its potential. And it still continues to flourish. You, too, begin your life as a “seed”. Each day, you get a pocket full of new seeds to do with as you will. Every idea you plant, every relationship you form and every change you imagine starts as one of these tiny seeds. Each little planting has the potential to grow, expand and create a miracle. With the right opportunity, a tiny seed can reach the greatest of heights. It simply needs the right environment to flourish. What are you planting in your life? Have you given your “seeds” what they need to reach their potential? Start today. Like this perspective? Read more.